In 1929, theoretical physicist Paul Dirac announced: "The general theory of quantum mechanics is now complete. . . . The underlying physical laws necessary for the mathematical theory of a large part of physics and the whole of chemistry are thus completely known." The discipline at the point was four years old. 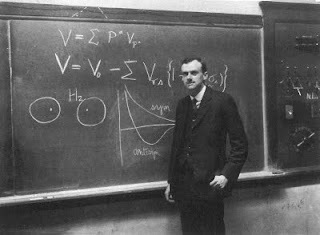 Dirac himself was just 27. But eight decades later, we see that his optimistic evaluation was too modest. In addition to a "large part of physics and the whole of chemistry," the theory now is extended to a significant part of biology, essentially all of electronics and nuclear physics, and a large part of astrophysics and cosmology. Really? A significant part of biology and the whole of chemistry? Both chemists and ecologists may be interested to know this. Let's take stock of this viewpoint since it highlights a quote by Dirac which has been marshaled all too often in support of reductionism. It's time to put the quote in context. Paul Dirac was one of the greatest scientists of the twentieth century and perhaps of all time, but he was no chemist or biologist. He made that statement about quantum mechanics in 1929 when quantum mechanics was at the height of its powers. The complete theory had just been developed by Heisenberg, Born, Schrodinger, Dirac and others and it had turned into physics's crowning achievement. At the same time scientists like Pauling and Slater were applying the theory to chemistry. Suddenly the world seemed to be at physicists' feet and there seemed to be no limit to what physics could achieve. But this was not the case. The optimism about reductionism endured for the next couple of decades when physicists made monumental contributions to chemistry and molecular biology. And yet the waning years of the millennium indicated that the reach of reductionism was distinctly limited. We were just getting warmed up. As we made forays into expansive fields of chemistry and biology like self-assembly, chemical biology, population genetics, ecology, systems biology and neuroscience, it became clear that the essence of complex systems was emergence. Emergent properties seemed to demand understanding at their own levels and could not be reduced to interactions between particles and fields. At the level of every science there emerged foundational laws, not reducible to deeper principles, that served as the bedrock for that particular science. Today, as we encounter new horizons in the study of signaling networks, brain plasticity and chaotic ecological systems, it's clear that we will have to find and formulate fundamental laws specific to every system and science. No, if anything, Dirac's statement was not too modest but too ambitious; as spectacular as its predictions have been, "a significant part of biology" and chemistry cannot be explained on the basis of quantum theory. In fact, although I am not an expert in cosmology, the extension of quantum predictions even to cosmology seems surprising to me. Isn't gravity the other dominant force that needs to be taken into account when formulating cosmological explanations? And isn't the welding of quantum theory and gravity the great unsolved problem of physics? To me the inclusion of large parts of cosmology and astrophysics under the quantum fold seems premature. Interestingly, this abiding interest in reductionist statements reminds me a of minor debate about reductionism between Freeman Dyson and Steven Weinberg that took place in the 90s. Dyson who has been critical of reductionism for a while penned an expressive piece arguing against reductionist philosophy in the New York Review of Books. In reply, Weinberg who has been an arch reductionist replied with his own spirited rebuttal. This rebuttal has been discussed in Weinberg's engaging collection of essays "Facing Up: Science and its Cultural Adversaries". Weinberg defined what he thought were two distinct critiques of reductionism. One was the critique of reductionism as a working principle. The other was a more fundamental, philosophical critique of reductionism as being unable to account for higher-order phenomena even in principle. Weinberg thus was making a distinction between reductionism in practice and reductionism in principle. According to him, scientists like Dyson who criticized reductionism really had a problem with the former manifestation of reductionism, as a working principle that did not really allow them to solve problems in chemistry, biology, economics or psychology. In contrast, reductionism in principle was alive and well and was being the unwitting victim of the anti-reductionists' axe. In essence Weinberg was saying that, sure, even if quarks cannot directly help you to solve the mysteries of chromosomes, they still surely account for chromosomal properties in principle. But to me such a distinction is meaningless beyond a point. The working scientist in his or her everyday scientific life really only cares about reductionism as a working principle, not as final causation. The fact that quarks can account for chromosomes in principle is not very consequential; a biologist could care less if there were elves manipulating the fundamental constituents of biological systems. In addition, a lot of biology and chemistry progresses through the construction of models which are not even required to reflect the presence of the very fundamental laws. At the very least, the extolling of reductionism as being able to ultimately account for all kinds of phenomena is a trivial statement; it's like saying that everything is made out of atoms. So what? That hardly helps us cure cancer. "...The difficulty is only that the exact application of these laws leads to equations much too complicated to be soluble. It therefore becomes desirable that approximate practical methods of applying quantum mechanics should be developed, which can lead to an explanation of the main features of complex atomic systems without too much computation." It's those words "approximation", "complex" and "computation" that encompass the essence of chemistry, biology and all the other sciences which Dirac did not mention. He may have been right after all. "In addition, a lot of biology and chemistry progresses through the construction of models which are not even required to reflect the presence of the very fundamental laws." This statement seems highly debatable to me. For example imagine an organic sythesis guy working out a new reaction mechanism using the usual arrows. While this method works well in many cases and will likely get him in the right direction, would we believe in a new mechanism postulated on the basis of such "evidence"? Certainly not. I'm not into mechanisms, but AFAIK the journals that usually publish new mechanisms today require DFT calculations. And IMHO it is the (probably many) cases where such heuristic approaches suddenly fail (that maybe have been successful for a long time), when the underlying theory becomes suddenly important, because there is no other way to gain the additional insight needed for successfully tackling the problem. Earlier in the text you mention self-assembly as an example where reductionism breaks down. This is IMHO a particularly interesting example. Self-assembly has been (and still is) successfully investigated using molecular dynamics simulation (MD, see e.g. http://www.youtube.com/watch?v=tn4Cjcc5fxw ). MD works on the basis of particles interacting on the basis of classical mechanics. I wholeheartedly agree that self-assemblation-phenomena cannot directly be deduced from Newton's 2nd law. However, all informational content is included in the "jiggling and wiggling of the atoms" (as Feynman puts is). It's simply too much Information for the human mind too capture. The informational content does not fit into a form that one can put on a powerpoint slide for Macromolecular Chemistry 101. However, this is exactly what computers and numerical analysis are for. It is not always necessary to use the concept 'emergence' to beat the physicists' claim of 'completely solving' all sciences. They are not mistaken in not seeing the complexity, in fact. Instead they are not interested in complexity at all anyway. The theoretical possibility to solve all certainly does not means the practicalness to do so, but this just satisfies pure theoretical physicists quite enough. Good point. It's worth reading David Deutsch's views on this subject. Deutsch says that even in principle reductionism does not solve your problems. As a simple example he illustrates the arrow of time which runs both ways, a fact that does not follow at all simply from observing the atomic motions in an event (which according to physics can go both ways and yet in practice go only one way). I'm not sure what to make out of your arguments that working biologists couldn't care less about reduction... as if that were an argument against the concept. Car mechanics couldn't care less about thermodynamic cycles, I guess, but does this somehow constitute an argument against thermodynamics or its applicability to motor design? My main objection is, however, that reductionism is not something theorists dream about, it's something that's been worked on every day. E.g., you can understand photosynthesis as a higher level phenomenon by just giving the effective chemical formula. You can also go into the details and look at the protein complexes and their tasks. Or you go to the molecular dynamics behind it all and describe it as a physical/chemical step-by-step process where light energy is absorbed, transferred, and stored, till water gets oxidized at a metallic center. What happens to the oyxgen created in the process? Which path do the electrons take, which the protons, how and where are they 'used', for what biological purpose? That's all reduction of a biological phenomenon to its physical basics: single energetic excitations carried to single molecules in discrete steps, no magic or higher-level processes involved. And the same research goes on about many, many relevant biological systems from your eyes to your brain, from birds' beaks to worms' nerve processing. That doesn't mean that higher-level processes disappear or that a higher-level description is no longer as correct as before and still more practical to use in many contexts. But to treat reductionism today as 'just a principle, no real-world application available' seems somewhat uninformed to me. ...a trivial statement; it's like saying that everything is made out of atoms. So what? That hardly helps us cure cancer. I thought that was how radiation therapy worked. But I guess the fact it works is what makes it trivial.